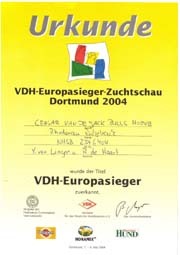 On 17th October 2004 Ceasar became German Champion (VDH). 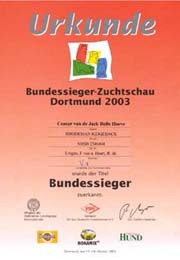 We went to the 5 following German shows to win the title in 13 months. 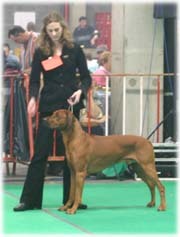 Belgium Championship: 12 months between first and last CAC, CAC only provided to BOB or BOS. 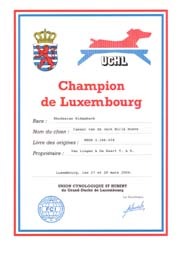 On 27th March 2004, Ceasar reached the age of 3 years and received after winning the Exposition Canine Internationale in Champion Classon the title Luxembourg Champion. 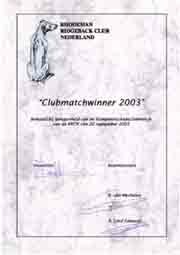 On the 20th september 2003 we went to the RRCN Clubmatch (total 128 RR's), Ceasar became 1st Excellent, CAC/BISS. 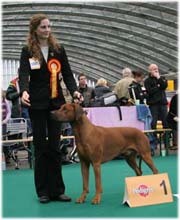 With this great result Ceasar won the title RRCN Clubmatchwinner 2003. 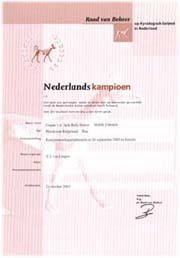 On 29 November 2004 we went to the Winner in Amsterdam (total 56 RR's), Ceasar became 1st Excellent, CAC/CACIB/BOB under breed specialist J. Fatauros. 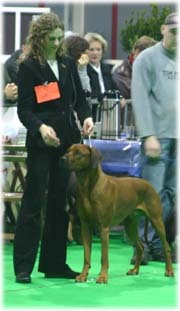 With this pleasant result Ceasar won the title Winner 2004. On the 6th of August we entered the Danish RR Speciality (total 78 RR's). 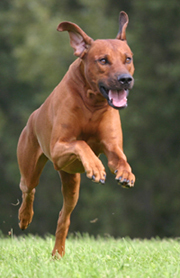 Ceasar became 1st Excellent CAC/BISS under breedspecialist Linda Costa (AUS). On the 16th of May we arrived at the Belgium Clubmatch (total 67 RR's), Ceasar did great and became 1st Excellent CAC/BISS under judge Ivana Bakal (Croatia). 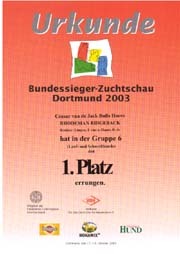 On the 17th October 2003 we went to Germany for the Bundessieger Zuchtschau (total 68 RR's) in Dortmund, Ceasar did a remarkable job this weekend and became 1st Excellent VDH-CAC/DZRR-CAC/CACIB/BOB and 1st BOG/3rd BIS!! 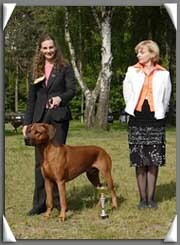 With this fantastic result Ceasar won the title Bundessieger 2003 and became 3rd BEST IN SHOW of 5000 dogs! 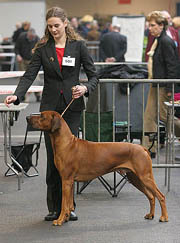 Ceasar also entered the Spezial Zuchtschau DZZR (total 50 RR's) on the 18th October 2003 in Dortmund. 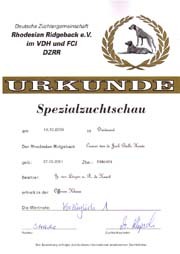 Ceasar did it again and became 1st Excellent VDH-CAC/DZRR-CAC/BISS!! 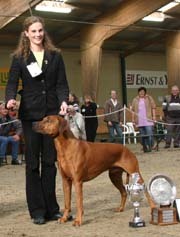 On the 18th of April we went to the Brabowinner 2004 in Antwerp, Belgium. 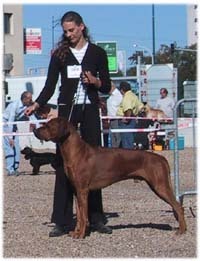 Ceasar had a marvelous day 1st Excellent CAC/CACIB/BOB 2BOG, with this result Ceasar won the title BRABO Winner 2004. On the 24th August 2003 we went to the E.L.S.A. 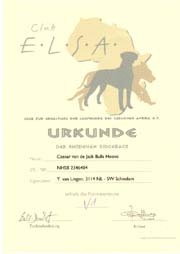 Clubmatch (total 58 RR's) in Germany, Ceasar became 1st Excellent, VDH-CAC/ELSA-CAC/RBISS. The E.L.S.A. Clubmatch was our first show in a foreign country, it was held in a backyard of a castle. In this wonderful environment with the beautiful weather we met some nice people and almost forgot we entered a show. It was also the first time Ceasar showed outside and he really loved it. 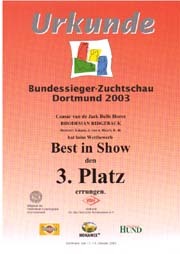 In the weekend of 13th September 2003 we went to the Pontoise Clubmatch and the Speciality Show in France. 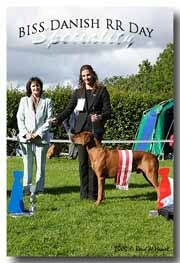 Ceasar became 1st Excellent in the open class of the Speciality Show , after competing the Champions Class Ceasar won CACS/Res.CACIB. Both shows were helt outside with typical French weather. After the show we had some nice French dinners with some lovely friends who made the decision very easy..... we'll be back next year.